You can feel optimistic that caring for your family is easier with Food Club®. Since 1945, Food Club has delivered great tasting and affordable products to your hometown grocer, always embracing the importance of your community. You should never have to choose between great food and saving money - and with over 2,600 items you won't have to. So the next time you visit your local grocery store, count on Food Club®. Full Circle™ is committed to delivering great-tasting, 100% natural, organic, and environmentally-friendly products for the entire family at affordable prices. We are continually looking at new ways to improve our products and packaging so they enhance the quality of life for your family, friends, and our planet. That's the Full Circle™ promise! "Return to a natural way of living!" Learn more at Full Circle's website. We bring the world to your kitchen table with carefully selected food, inspired by flavors from across the globe or across the road. Every product we share is connected to a culture, cuisine, recipe or story. Join us and discover Culinary Tours! Learn more at Culinary Tour's website. Buckley Farms is a delicious line of meat entrees made with quality ingredients that consistently deliver great flavor. Whether it's the mouthwatering chicken or the scrumptious meat balls, Buckley Farms offers convenient solutions to make meal time delicious and easy! From first-aid to vitamins, over-the-counter drugs and beauty care, TopCare® has affordable products that are as effective as the big brands, all in your favorite grocery store. Each product is laboratory tested to guarantee its highest quality, so you can get everything you need in one shopping trip and get home to focus on the important things, taking care of your family. Learn more at TopCare's website. From tissues to paper towels, let Simply Done clean up life's little messes for less. Whether it's spilled spaghetti or a makeup mistake, our array of soft, strong and absorbent paper products helps you wipe it off - without missing a beat. Learn more at Simply Done's website. There's nothing like sitting seaside, listening to the waves and enjoying the ocean breeze, as ships enter the harbor with fresh-caught fish and seafood. Today, 40 Knots Seafood™ invites you to take your taste buds on a culinary cruise you will always remember. Our seafood is flash frozen to capture every ounce of flavor and deliver delicious, succulent seafood from the ocean to your table. 40 Knots Seafood provides quality, responsibly caught seafood you can feel good about eating. Learn more at 40 Knot's website. We understand you're busy and are searching for simple, convenient and delicious meal solutions. @ease allows you to forget the hassle. 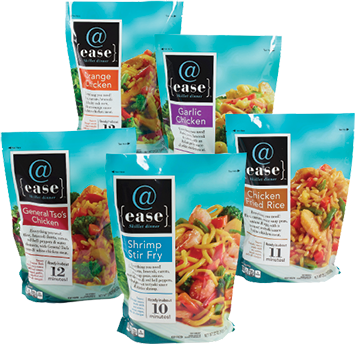 When you select @ease you know you're buying delicious products that can be prepared quickly without having to sacrifice great taste in the process. Learn more at @ease's website. It's all in the crisp crunch of the first bite. The chips' savory seasoning perfectly pairs with succulent salsa to create harmonious hues of enchanting flavor. A good chip goes a long way, especially if it's an authentic, age-old recipe: Abuela's secret. Our white corn tortilla chips evoke memories of the love grandma shared in the kitchen. At Abuela's Autentico, you will experience grandma's cooking every time you taste our products-expertly curated, crafted and created in locally in Utah. Learn more at Abuela's Autentico's website. When you're looking for the tastiest candies and snacks look no further than Pinch or a Pound fresh packs. With a wide assortment of quality snacks with sealed-in freshness, Pinch or a Pound fresh packs make the perfect on-the-go treat. Beehive Bread & Pastry Co.
Beehive Bread & Pastry Co. uses only the finest ingredients to carefully craft true artisan-style breads and signature pastries that are sure to please your palate. From the crust to the crumb, Beehive Bread & Pastry Co. artisan breads are the perfect complement to any meal. And no meal is complete without the sweet treat of dessert... from the perfect pie to a tasty eclair, Beehive Bread & Pastry Co. also satisfies the sweet tooth in us all. Our rolls are made with the best ingredients, including 100% pure, sweet cream butter and have a melt-in-your-mouth flavor that will keep everyone coming back for more. Twice the size of other freezer rolls, Beehive Rolls, deliver twice the taste with 0 trans-fats. Beehive Rolls are locally produced and make the perfect addition to any meal. b·lēve is a premium beauty care brand consisting of multi-benefit hair, skin and body care products and accessories that deliver on the promise of providing youth renewing benefits at an affordable price. b·lēve utilizes natural elements to create high performance products. Learn more at b·lēve's website. Birchberry is our exclusive line of delicatessen products. They are mouthwatering, high-quality items made with all-natural ingredients, hand-crafted by people who genuinely care about giving you both quality and value. Using only the finest meats, cheeses and other natural ingredients, Birchberry gives you excellent flavor every time. Learn more at Birchberry's website. Whether it's in the fireplace or on the patio, CharKing® gives you the briquettes, lighter fluid and logs you need for the perfect flame. Our regular, hickory and mesquite briquettes light fast and burn hot, because no one should have to wait for a hot grill. Great burgers start with great charcoal, so the next time you decide to fire up the grill, count on CharKing®. Learn more at CharKing's website. Di Lusso Deli Company has been creating the finest deli meats and cheeses since 1919. Our products are crafted using traditional methods and recipes handed down through generations - resulting in authentic Italian flavors and a standard of quality that's rare today. Adding only the finest ingredients is just as important to us as adding all of our heart and soul. Learn more at Di Lusso's website. Fresh Farms is delicious and nutritious. Their products are 100% natural with no artificial colors or flavors. They are USDA Organic, Gluten Free and Non-GMO. You will not regret trying Fresh Farms. Hurry in today to try the mixes below and so many more! No one could understand the special bond between people and their pets better than PAWS Premium. Our full line of high-quality dog and cat food, chews, treats, toys and other accessories can only strengthen the bond between you and your furry friend. PAWS Premium has something to satisfy every pet from the couch potato to the party animal. Let PAWS Premium help you nurture your pet's mind, body and soul. For the pet lover who understands that you don't have to sacrifice quality to save budget, pick PAWS Premium! Learn more at Paws' website. Pure Popcorn Perfection It's a moment of maize-filled magic when we pop the carefully cultivated kernels of our Pip Pop popcorn. Each kernel is heated to just the right temperature until it bursts out of its shell creating light, fluffy perfection. Then, the popcorn is gilded with golden butter and scrumptious salt, creating a taste-bud trip for every popcorn aficionado. Pip Pop popcorn is proudly popped in Utah using U.S. grown, non-GMO popcorn. Our popcorn is hand-crafted in small batches, using a special process that eliminates un-popped kernels, leaving you more popcorn to enjoy. Pip Pop popcorn is gluten free and satisfies the authentic, movie theatre popcorn taste you crave. Learn more at Pip Pop's website. We know that you want to take care of your furry family member like you take care of yourself. Our high quality pet food provides options for grain free and meat, poultry or fish as the first ingredient, and is carefully blended with real, wholesome ingredients from a variety of food groups. Pure Harmony, whole plate nutrition to let your pet thrive. Learn more at Pure Harmony's website. At Red Button Vintage Creamery, creating authentic, traditional desserts is our newest specialty. Our ice cream and pies are made with only the freshest and finest ingredients. There are 28 different ice cream flavors, including classics like Vanilla Bean and Burnt Almond Fudge as well as unique flavors like Sprinkled Animal Cookie, Raspberry Lemonade sherbet and Black Licorice. With so many delicious flavors, you are sure to find a favorite for each member of your family. We offer six flavors of pies from dazzleberry to pineapple upside down. Our pies have the perfect balance of Grade A fruit, fine flour, creamery butter, all-natural sugar and other quality ingredients from the best sources. Crusts in many of the pies include subtle flavors like almond and vanilla for a unique taste every time. Plus, we intentionally use a slower baking process, including hand-laid lattice tops, to ensure you enjoy a home-style pie straight from your oven. Learn more at the Red Button Vintage Creamery website. Look for ShurSaving products in our store for this great brand that allows everyday money-saving prices on items you need. The ShurSaving line is designed to be value priced with the competition. Nothing fancy; just everyday good deals. Learn more at ShurSaving's website. Life is better frosted and glazed. At Sweet P's Bake Shop®, we think everyone deserves to indulge - from donuts to red velvet cupcakes. Our affordable, tasty delights are perfect for an everyday treat or a decadent occasion and can be found in the bakery section of your local grocery store. So go ahead - satisfy your sweet tooth with Sweet P's Bake Shop®. Learn more at Sweet P's website. You spend hours daydreaming where your baby's tiny feet will take them in their lifetime. As a mom, it is your job to guide those little footsteps down a path of health and happiness. On the mission to make every mom's life a little easier, we are proud to carry a full line of Tippy Toes products. Starting from the first trip home and through all the clumsy steps, Tippy Toes is there to hold your hand along the way. Rest assured, we have everything you will need to soothe, comfort, and nurture your baby from day one. Tippy Toes ... Caring for your little one from tip to toe. Learn more at Tippy Toe's website. Shopping on a budget shouldn't mean sacrificing. Valu Time® delivers everyday affordability to help fill up your grocery cart. It's our mission to make taking care of your family just a little bit easier. We're here to meet your basic needs, and with hundreds of items at low prices Valu Time® has you covered. Learn more at Valu Time's website. No matter your point of view or outlook on life, Wide Awake Coffee Co. has a flavor to suit your own distinct personality. With vibrant characters, inspired by our planet's colorful wildlife, you're sure to find your coffee destiny. We offer a wide variety of ground and whole bean coffee, as well as single serve cups. Learn more at Wide Awake Coffee Co's website.